Rajasthan is a place of exquisite architecture and rich culture. The medieval sandstone edifices and monuments in various cities and forts of Rajasthan is a fusion of European and Islamic architecture with Hindu Rajput style. 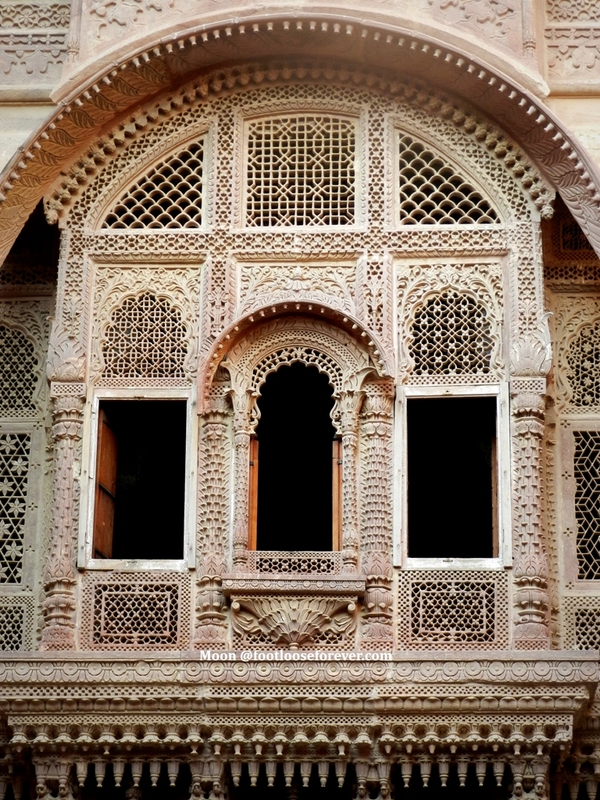 Hence, the moment I saw this week’s photo challenge theme ‘intricate‘ I could immediately relate with it nothing but the fine stone detailing I observed on several palatial facades, walls and interiors of age-old Rajasthani architectures. This one is from the royal palace inside Meherangarh Fort, Jodhpur. Published in response to Daily Post Weekly Photo Challenge: Intricate. Grand and intricate! Yes, one can’t help but think of the talent and effort that went into creating such pieces. What can be more intricate than this Moon ? truly beautiful .. so much so its aching! Intricacy of Jali work is amazing and the pic captures it very well. What could be more intricate than this piece…just wondering how many months/years would have taken to build this. That’s an amazing and intricate architecture. And a beautiful click, Moon. Amazing isn’t it! Pure hand work no machines involved! I too enjoyed taking such close captures. Yes… I know Indrani, I have seen so many excellent pics on your blog. Thank you for the comment.